The lost gas savings appear to be between $2,500 and $5,000. It is hard to see how Peters' experience justifies a $10,000 award. The use of MPG makes shortcomings in a car's actual fuel efficiency seem large where they matter least--on cars that are very efficient. You see many car forums where hybrid drivers are frustrated that they're getting "only" 42 MPG instead of the promised 50. The effect on gas consumption, however, is negligible. I'm not defending inaccurate MPG reporting by car companies. I am saying that the practical difference between 42 MPG and 50 MPG is small. In contrast, consider a minivan driver who expects 19 MPG but gets 17 MPG in reality. How frustrated is the driver? It seems like a small difference, either in absolute terms (2 miles) or percentage terms (a 10% deficiency). That difference in MPG is more consequential than the difference between 40 and 50 MPG. It translates to roughly 7 gallons every 1,000 miles, or an additional cost of $3,675 over 150,000 miles of driving. 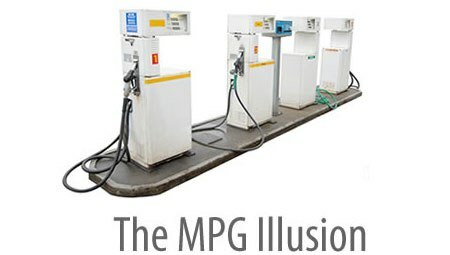 MPG makes shortcomings in a car's actual fuel efficiency seem small where they matter most--on cars that are inefficient.